CHRISTMAS IS NEARING AND I JUST WANTED TO SAY MERRY CHRISTMAS. JUST WANTED TO LET YOU KNOW THAT YOU ARE ALWAYS THOUGHT OF. Two years have gone by since we said farewell but not goodbye. You are so very much alive in me. I feel privileged to have known such a wonderful individual. You were always a good friend before and during Explorers. I saw you over come your fears and reach all goals you set for your self. You are an inspiration to me and many others. You are always with me and I think of you everytime I see an officer because I know you are serving the Lord and watching over them. God Bless Tiffany. You will never be forgotten. Though I only knew you for a short time, you became a good friend and I wished things could have been different. You are missed and I think about you often. You were a sweet girl and bore a tremendous heart for others including your family whom I know misses you dearly. I think that somehow you are looking out for your fellow officers here now. It is hard to believe it has been a year since you left us. Things just aren't the same. I still find myself looking out of the window expecting to catch a glimpse of you and getting ready to tease you about your latest adventure at work. You touched so many of us with your love of life, your joy, and your dreams. We miss you so much. You have been such a great friend. I remember all the fun we had on the sidelines at soccer games. And the laughter you brought me every time you fell down chasing after that ball! But more importantly I will always remember your heart. You never gave up. And I admired you and Chad for being so determined in your goal of becoming cops. I'll never forget the time you tried to handcuff me, promising that you'd let me go right away. I think I was smart not to let you! You have made such an impact on me, and I will always feel so privilaged that you have been a part of my life. Your daughter was one in a million! Always be proud of how well you raised her. Her personality was influenced by her outstanding parents. The two of you are constantly in my thoughts and prayers. Thank you so much for making me welcome in your family. I love you guys! Stay strong in God and He will be your strength. Hang on to those memories of your amazing sister. We both know how much she means to you and every life she touched along the way. Thank you so much for allowing me to remember her with you. I'm so proud of you for sticking with your dream. I know she is in Heaven smiling down on you as she watches you finish what she started. Make her proud, Captain. Serve God like she did and He will do amazing things through you too. Always, me. To you my friend; from the time since i met you the day we got hired and all thru the academy; to the day you got the bad news about DPD academy and what a great thrill to see you get your DREAM becoming a Police Officer. what a shame that we did not get to keep you with us but what luck that I did get to meet you and just for a bit be part of your life. you were a great Fighter with a heart of a lion. I will miss you. GOD BLESS and THANKS!!!!!! I never met or knew Tiffany, but I do know her brother Chad. went on to score 3 firsts and a third out of 7 events. Even though we never met, I felt compelled to write. I know that any peace officer getting killed in the line of duty is an extreme tragedy, but seeing your spot on the Officer Down page affected me even more than all the others. Looking at your picture and reading all the other reflections written for you, I realized you could've been me. I am only 21 years old, and I just got out of the academy last week. But being a police officer was a life-long dream of mine, and you are the only other female I know besides myself who was able to fulfill that dream so early in life. I know exactly why you wanted to be a cop, and I know the pride you felt the day you got hired. I know all the training you got, and how much they probably tried to prepare you for the day when the "s*** went down." I know that you were saddened by hearing about the deaths of other police officers, and I know that deep down, you never really thought it would ever happen to you. And whispered 'Come with me'. We remember the gleam and joy in your eyes as you spoke of your "dream job", and how you came to our door and showed us your badge when you finally achieved your goal. The vision of a young girl sprinting across her family's lawn is one of the many cherished memories we will have of you. Our thoughts and prayers are with your family. You touched so many lives and we are all better people for having known you. Now God has put you among the stars so that you can touch so many others...and continue to do what you always wanted to do: serve and protect. We thank You Lord for Tiffany. Words simply cannot describe the feelings that we have following the death in the line of duty of our beloved daughter. We watched Tiffany as she grew and matured and observed her enthusiasm as she prepared to enter the only career that she ever showed an interest in. We shared her excitement as she left for work each night and when she returned each morning. We know that she died doing what she loved...serving our Lord and performing police duties. She will never be forgotten and will always be loved. What a tragedy to not only lose a young life but a young law enforcement life! My thoughts and prayers are with you, your family and co-workers. Though I did not know you, I know what motivated you to become a police officer. We at the International Association of Women Police salute Officer Hickey and want those who survive to know that we care. Godspeed, Tiffany! Hey Tiff! I can't believe it's been four years since you left us. I still have the photo up of all the girls in our academy class. You were the smallest in size, but the biggest in heart, courage and desire. I will never take that photo down. I think of you every single day and choose to believe you are my guardian angel while I am on the streets. You were a great friend and a great cop! I miss you very much. Well I just saw that you were added to the Texas Peace Officer Memorial on May 4th. It's past time. You gave the ultimate for us. I know that you are up there looking over all of your brothers and sisters in blue, and we in turn will always remember you. I just got something new today. It serves as a reminder for you. I wear it proudly and show it off, so everyone knows the price that you paid. I wish we could talk in person, I can't wait to meet you someday. I knew Tiffany for about three years prior to the end of her watch. She was the one who told me of the Police Explorer Program and encouraed me to get incvolved. I will never forget her using her newly learned defense tactics on me out at the soccer fields while we were both refereeing. She is the main reason that I joined the law enforcement community. 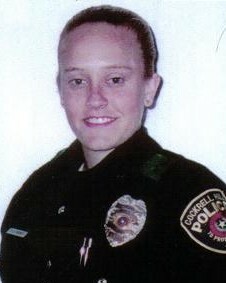 I graduated the Academy in May 2002 as the class valedictorian, and soon after got hired at Mexia PD. I think of her still to this day, and I know in my heart that she is watching over every single officer, jus because that is the kind of person she was. It's me again! Just wanted to wish you a Merry Christmas! I thought about you during the holidays. I heard on the news that your family united with the people that your organs were donated to. As I have said before, please look over me while I am working. I hope you know that you are always with me. You are missed, but not forgotten!! I am telling you again, Happy Birthday. Today, you would have been 24, just like I am today. It is truly amazing how many similarities we share and never even knew each other. I truly am sorry that I never got a chance to have met you. Please keep your eye on me as I do my job from day to day. Keep me safe! Don't think that you have been forgotten. Just wanted to say happy birthday, a few days early. Sorry that we never met. I had just taken the state peace officer exam when Officer Hickey was injured. I remember this event well because we were the same age at the time. At that time it was possible to be a peace officer under the age of 21 in Texas (It is currently under change) and I thought it odd to hear of another officer like me. I wanted to meet her when she recovered. Sadly approx a week later she passed away and I was never able to. Now nearly three years has passed, I'm a peace officer and many officer from around the state and nation have passed. Yet with every visit to the ODMP website I think of Officer Hickey. May she rest in peace. God Bless you and Im sorry for your loss, Im 21 yrs old and majoring in criminal justice. My dream is to become a police officer and I will keep you in my heart when I go out on patrol in future.God Bless you and your family and friends! God Bless This Family, Rest in peace Tiffany !!! Officer Hickey, your watch is over and our department salutes you and your tour. May you watch over the gates of heaven, as you watched over the citizens of Cockrell Hill, Texas.